Eli 0.0 was born on July 31, 2001. We had a very difficult time of it, starting off, and then September 11 happened. It was all entirely overwhelming, and if that wasn't enough, there was a housing development going up behind our back fence, with bulldozers all day long. So in December of that year, I decided to buy the quietest car I could find. I just wanted a place where I could sit and feel at peace, something that would numb the roar of sound coming from the suddenly too-loud world. The car I wound up with was a Lexus ES300. This was the entry-level Lexus, but to me, it might as well have been a Rolls Royce. I'd never driven a car anywhere near the quality of this one. Over the years, Eli happened in that car. Crayon marks near the passenger door. 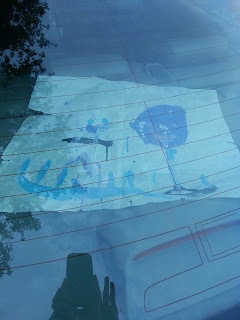 A piece of his art from when he was four, still under the back window. An assortment of toys that evolved into an assortment of sporting equipment. A heavily scraped back bumper, worn from the entrance and exit of a hockey bag hundreds of times. Mostly, though, the car contains thousands of conversations, from toddler to pre-teen. I'd give anything to have tapes of all those conversations. In eleven years in that car, cross words have almost never passed between us. I have so many happy memories that my brain can't hold them all. Somehow, he made it from a warm, loving toddler to a warm, loving 12.3. He's been The Enthusiasm Engine all these years, and I hope that never changes. He taught me about enthusiasm, and about trying harder and being better. These are simple lessons when they come from a child, and they're simple because they're true. I helped him, and he helped me. We've been talking lately about replacing the car. It has 130,000 miles on it now, and even though it has a lifetime (literally) of memories, it's time to put the old girl down. After looking for a long and unproductive time, I finally found a car I wanted to buy: the Honda Accord hybrid. It reached dealers on October 31, and I drove one the next day. And it's absolutely terrific, except the trunk is slightly too small for Eli's hockey bag. I can--and did--order a hockey bag that was 3" more narrow, and it will fit, but I can't buy the car. No one can, apparently, because Honda isn't actually selling them. They have demo models--one at a dealership, if they're lucky--but they aren't allowed to sell them. In other words, it was entirely a paper launch, and real stock isn't supposed to arrive in any quantities until late January or early February. I'm thoroughly annoyed--finally find a car to buy, and it can't be bought--but it gives me a few more months to come to terms with saying goodbye.